If you’re a serious coffee geek like the we are – with a home brew bar and a stash of freshly roasted coffee beans always at your disposal – you can improve the quality of the coffee you make by calibrating the parameters in which you brew coffee. Three important brewing parameters that people love to talk about are Roast Type, Coffee-Water Ratio, and Grind. There are, however, a number of brewing parameters hardly being discussed but are just as important to making a delicious cup of filter coffee. While not exactly a brewing parameter, how the coffee beans were roasted affects the spectrum of flavors that you can extract from coffee. Lighter roasts allow you to extract subtle flavor notes unique to the terroir in which the coffee was grown, which is why specialty coffee roasters prefer light to medium roasted coffees to bring out exotic fruity and floral notes. Light roasts that's underdeveloped can have a grassy or raw taste. Darker roasts tend to be bittersweet or a very pronounced bitter taste. Dark Roasts are ideal for espresso because they complement the sweetness of milk really well. Roast coffee beans too dark, however, and you have coffee that tastes burnt - something similar to charcoal. I would suggest you choose a good-quality medium roast from your favorite specialty roaster. Let Matt Perger teach you more on the art of roasting. Coffee-water ratio, which is also the 'coffee recipe', affects the strength of the cup you brew.. The sweet spot for this ratio for filter coffee, according to Michael Phillips from Blue Bottle, can range from 1:11 (stronger) to 1:16 (weaker). If you want to really bring out fruity and floral wine-like flavor notes from single origin coffee, opt for a recipe closer to the 1:16 range. Opt for the stronger 1:11 ratio if you're brewing a blend for a full-bodied cup. Let Michael Phillips from Blue Bottle Coffee show you how to brew an amazing cup of coffee at home. Grind size, the evenness of grind size, and the time that elapses between grinding coffee and brewing a cup (I know, that's a lot) can dramatically affect the quality of the cup you produce. This is why great baristas calibrate grind size depending on the brewing method they want to use (The general advice is to use coarser grounds for immersion brewing methods and a finer grind for pour-over and espresso). You should also be very particular about the evenness of grind, and you can do this by using a good-quality burr grinder. Don't use a blade grinder, it will result in a very uneven grind that will bring out a lot of unwanted bitterness in your cup. You should also grind coffee right before brewing so that precious aromatics in the beans don’t escape. Stay away from pre-ground coffee! For further reading, here is Matt Perger's take on surface area. Roast date is very important. Coffee should ideally be consumed within 3 weeks of roasting or else coffee becomes stale and you lose some of those delicious aromatics. Coffee may be good for up to one month depending on the coffee beans - but that's already a bit stretched. It is also important to let coffee air out for around 3 days (for filter coffee) after the roasting date so that you don’t extract overly earthy and vegetal flavor notes from underdeveloped beans. Do take note that coffee brewed 5 days after roasting will taste a bit different from coffee brewed 2 weeks after the roasting date. The temperature in which you brew coffee should go hand-in-hand with grind size and total brew time. For finer grinds, try brewing at lower temperatures to avoid over-extraction. If you’re using coarsely ground coffee, brew at higher temperatures and with a longer total contact time. The ideal temperature for brewing coffee is said to be between 195°F – 205°F. The longer coffee grounds come in contact with hot water, the higher the risk of over-extraction which can leave an undesirable bitter taste in your cup. If the contact time is too short, you can have under extracted coffee that tastes a bit woody and sour. Make sure you brew coffee with just the right amount of contact time between hot water and coffee grounds. 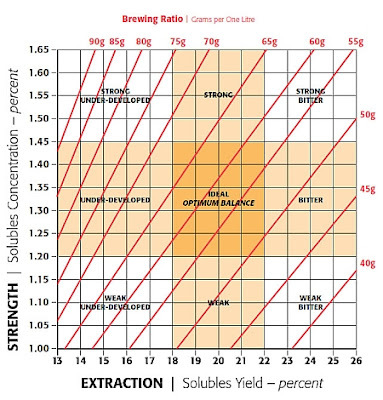 You should aim to extract around 18-22% of the coffee bean's mass, which is all the good stuff. Here'a a primer from Matt on coffee extraction and how you can taste it. The importance of bloom time is something I learned from the class with Michael Phillips. If you don’t give the coffee enough time to bloom, the carbon dioxide trapped in the beans (which are released upon contact with hot water) can limit the amount of coffee oils you can extract leading to under-extracted coffee. Coffee can absorb water that’s around twice its weight, so that’s a good guide on how much water to use. Depending on the recipe, you should allow the coffee grounds to bloom for around 30-50 seconds before pouring in the rest of the water. The TDS (total dissolved solids) of water refers to its mineral content - which also measures the hardness or softness of water. The ideal number of TDS is around 150mg/L. This is the level of TDS in water coffee geeks of the highest level will try to achieve. For home-brewers, it’s best to avoid water that has too much minerals or which had all its minerals removed (like distilled water). What you're looking for is clean and odour-free water and that's usually a result of filtered water or bottled mineral water. Just make sure it's within the acceptable TDS range is from 75-250mg/L and pH level is from 6.5 - 7.5. Try to test the bottled water that's available where you live and use one that you feel tastes best to achieve a consistent bre. To get the perfect water, you need to use a refractometer, or you might as well ask the water company about the quality (and TDS) of the water they supply. 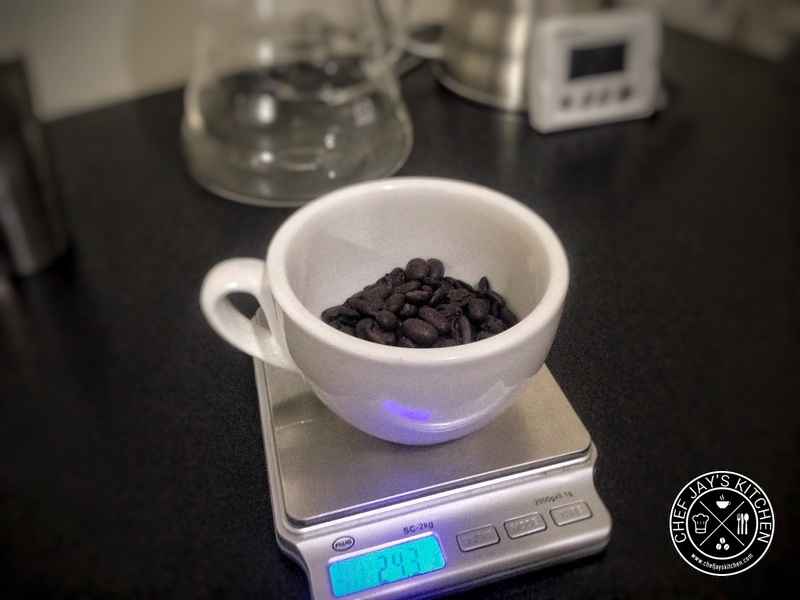 I hope this article helps you on your journey of brewing an amazing cup of coffee. 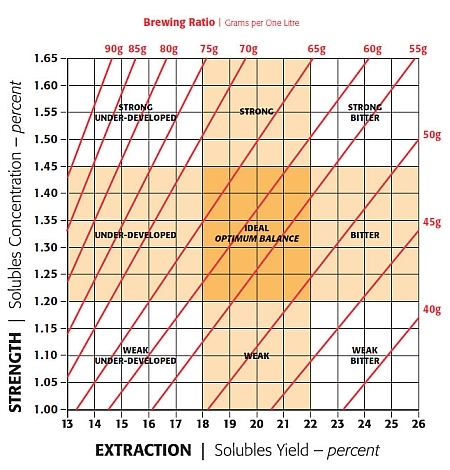 Is there a brewing parameter that you would add to the list? Let me know through the comments section.